Very public reports on institutional performance. The achievement of Michigan’s public universities is a critical factor as we look to participate in the knowledge economy of tomorrow. A well-educated, skilled talent base will help our state develop and attract new business opportunities. Universities also drive research and development, bring thousands of new faces into our state, and build lasting partnerships that advance our communities. These goals matter to all of us, and so does the performance of Michigan’s higher education system. 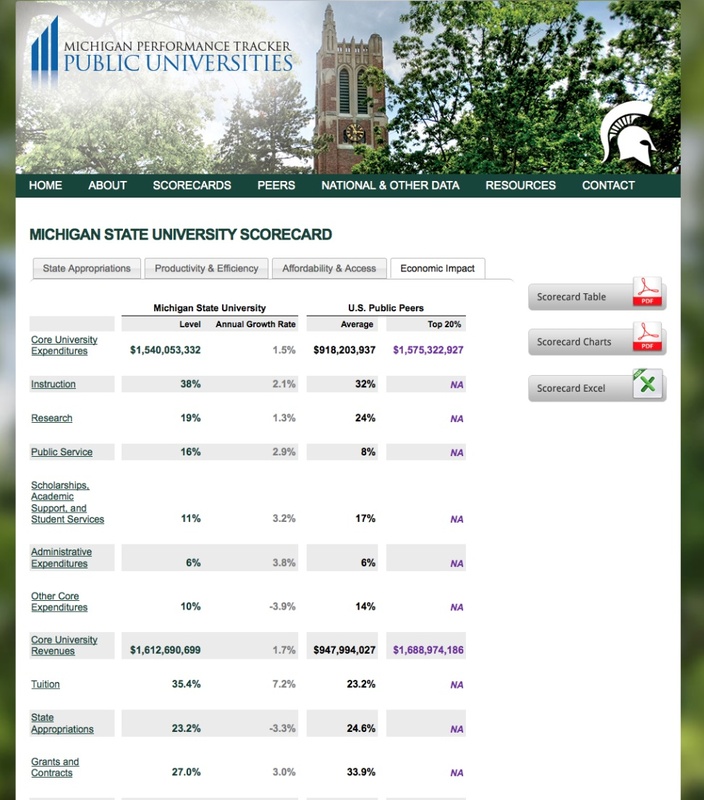 This website offers an overview of Michigan’s higher education achievement nationally, and shows how our universities are acting as incubators of future economic growth and change. There is a great deal of very interesting data in here from graduation rates to tuition fees and SSRs to salary costs. Sensibly, the bench marking is against peer institutions. Will we see others adopting a similar approach? And might it catch on in the UK? This entry was posted in Admin, Communications, Education, HE, international, Management, University, web and tagged Accountability, Administration, data, HE, international, KPI, Michigan, University by Paul. Bookmark the permalink. Too many Not Applicables in the US Public Peers Top 20% column. Helpful for anyoine wanting to make comparisons and gain an impression of US Univs though.